In the aftermath of the resignation of Jody Wilson-Raybould from the government, a companion narrative to her complaints about being pressured to not launch a criminal prosecution against the engineering firm SNC-Lavalin has arisen. Latterly, the relations between the former justice minister and the prime minister and his office seem to have been more of a tug of war than the authoritarian oppression in a questionable cause portrayed by Wilson-Raybould. Wilson-Raybould was seriously underqualified to be minister of justice, a post historically occupied by some of Canada's leading statesmen, including prime ministers or future prime ministers Sir John A. Macdonald, Sir John Thompson, Sir Charles Tupper, R.B. Bennett, Louis S. St. Laurent, Pierre E. Trudeau, and John Turner, and party leaders and deputy-leaders A.A. Dorion, Edward Blake, Ernest Lapointe, Sir Oliver Mowat (after 25 years as premier of Ontario), Sir Lomer Gouin (after 15 years as premier of Quebec), and the great John Crosbie. And other justice ministers of fairly recent memory, such as Davie Fulton, Lionel Chevrier, Marc Lalonde, Irwin Cotler and Peter MacKay, had earned considerable stature as lawyers or legislators. Wilson-Raybould was a Crown prosecutor for three years and then spent 12 years as a native rights activist-administrator and politician. But she personified the fusion of two groups to which the Justin Trudeau Liberal party and regime prostrated themselves like postulants before Pope Alexander (Borgia) VI (seeking to kiss a foot, nothing so egalitarian as a ring). As a chief commissioner of the British Columbia Treaties Commission, and as regional chief of the Association of First Nations in British Columbia, Wilson-Raybould and her husband authored an 800-page book called the British Columbia Association of First Nations Governance Toolkit — a Guide to Nation-Building. It was a toolkit for the self-emasculation of Canada as a sovereign jurisdiction, and a guide to the jurisdictional destruction of Canada as a nation and its voluntary submission, on grounds of the alleged moral turpitude of the European discoverers and settlers of this country, to the overlordship of the notoriously ragged self-defined communities of partially pre-European descended people in Canada. Her declared objective was to "take back" what the natives had lost. I have written here before, that where we are headed in public policy is the implicit recognition that the European occupation of Canada was morally indistinguishable, other than in the sophistication of its brutality, from the Nazi-Soviet occupation of Poland in 1939. Because the occupation was by waves and centuries of generations of peaceable civilians, the withdrawal of the invader, unlike the case of Poland in 1939–44, is not expected, merely the admission by the 98.5 per cent of the population who qualify as comparative latecomers, that the perfidy of their antecedents requires them to become the servile enrichers of the long-wronged natives. Wilson-Raybould came out of the ministerial gate like a fire horse and throughout her tenure wore her nativist colours threadbare. She declared the so-called Indian treaties to be invalid, and redefined them as the right of the natives "to self-determination and self-government." She was instrumental in trumpeting the (Justin) Trudeau government's "Rights and Recognition Framework," unveiled in February 2018, as shifting the rights under Section 35 of the Charter of Rights and Freedoms as not applying only to Aboriginal rights that existed in 1982, but to all laws and official practices. This would, in practice, have a severe impact on the disposition, regulation or exploitation of any significant natural resource anywhere in Canada. The economic development and growth of Canada that had anything to do with natural resources would be dictated by any of these 600 native organizations all purporting, with enthused government quiescence, to be "nations" negotiating, on a basis of equality with the one nation of all the rest of Canada, i.e., one nation of 601 juridically equal entities, although one particular entity comprises 98.5 per cent of the population and has been recognized by the world as Canada's government for 152 years. She intervened in the Restoule case, dealing with the Robinson treaties over the northern Great Lakes, and worked to ensure that the settlement would be declared retroactive to 1874 — a back-digging lottery jackpot for 21 First Nations without buying a ticket. The justice minister found herself in increasingly difficult disagreement with the minister for Crown-Indigenous Relations (a ludicrously Victorian title), Carolyn Bennett, who made a commendable effort to prevent the non-native 98.5 per cent of Canadians from being left shivering fiscally and culturally for the supposed wrongdoing of their forebears, and in the case of descendants of non-European immigrants, such as Asians or people from the Caribbean, coated in vicarious guilt. Some of us warned where this was going. The prime minister and his senior collaborators, including the former principal secretary (Gerald Butts) and the clerk of the Privy Council (Michael Wernick, a non-political figure and the country's senior civil servant), finally, after warning signals had become more frequent than a healthy jogger's heartbeat in mid-run, and louder than the foghorn of R.M.S. Queen Mary, tried to put on the brakes. The prime minister shuffled the justice minister to veteran's affairs (for which she was even less qualified than she was to be attorney general — I don't like to imagine what her conception of war veterans was). 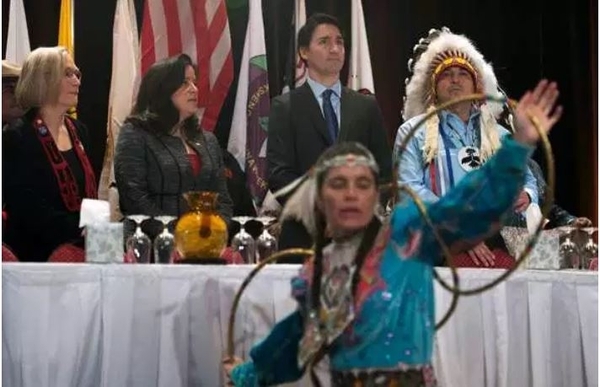 On her way out, on Jan. 11, Wilson-Raybould issued a "practice directive" to the justice ministry requiring Crown lawyers to cease adversarial arguments against Aboriginal litigants. She had, throughout her tenure, tied the government's hands in responding to suits from Aboriginal organizations, and as she left, she tried to impose a policy of outright surrender on the government and the 98.5 per cent majority of Canadians. Wernick, after his waffling ruminations about disorderly and violent tendencies in society, pulled himself together and invited Parliament and the media to focus on the former minister of justice's glaring conflict of interest as the attorney for the Crown. It was scandalous and an outrageous abuse of her office that as attorney for the Crown she ordered her officials to capitulate to Indigenous claimants. She should be criticized, not lionized, other than by her fellow Aboriginals, for whom she has been the most effective advocate of their cause since Louis Riel, and an unprecedentedly effective driver of the gravy train. The government deserves no credit for taking so long to wake up, but it can't be blamed for seeing the light at last. SNC-Lavalin is a sideshow, and as I have written here before, isn't much of a scandal, unless there were bribes on the repair of Montreal's Jacques Cartier Bridge. The opposition parties should have shaped up long before this, and taken the position that the Europeans and other immigrants who came to Canada moved into largely vacant land, through which perhaps 200,000 natives travelled nomadically, fine exemplars of a Bronze Age civilization that had not yet developed the wheel, knitted fabrics, or, with slight exceptions, agriculture or durable buildings. The first European governor, Samuel de Champlain, was a brilliant and civilized and philo-Aboriginal emissary of the civilization of Montaigne, Descartes, Leonardo, Michelangelo and, though a citizen of a rival nation, Shakespeare. We should all stop simpering, shut down the Indigenous grievance racket, devise a serious reform policy and stop acting like pathetic apologists for the brave and good people who built this country, the Aboriginal people first among them. The natives have entirely legitimate grievances and we have to address them, but not by throwing money at undemocratic leaders and accepting the blood libel that we are the descendants of barbarians. Nothing in the commonly accepted history of Canada, one of the world's most generous peoples, is further from the truth than that.